Teamwork is essential to the success of every company. Thinking, planning and delivering things are better when everyone works cooperatively. It is in this light that many companies include Team Building as part of their activities. 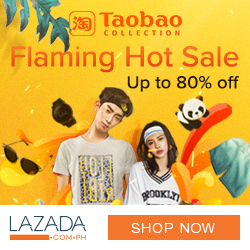 Looking for a venue that offers team building facilities is a little difficult within the metro--most of them are available in nearby provinces. For those who considers proximity, look no further because Selah Garden Hotel in Pasay offers a Team Building Package. Selah Garden Hotel is located some minutes away from MRT Taft and the Macapagal Avenue. Yes, it's an oasis found in the suburbs of Manila. Not only do they offer relaxing rooms with decadent beds, they also cater to groups who would like to have their team building activities. Along with co-bloggers, we experienced the team building facilities of Selah Garden Hotel. They offer both low and high rope challenges. A waiver had to be signed to make sure one is fit to try the activities. To pump things up, we started with a 'zumba' activity. I'm not really good in dancing and had a hard time following the steps, but it was fun! In no time, I was already sweating. A dance-off went next. We were divided into four groups and had to come up with some dance moves that will challenge the other teams. The very energetic Sir Alcon facilitated our team building activity. Other low rope activities include Whale Watch Balance, Swing Aboard, Team Wall and Trust Fall. After that, we were ready for the HIGH ROPE activities. For the adrenaline junkies, you will surely be delighted doing these. For those who are afraid of heights, it may be a good opportunity to conquer your fear. 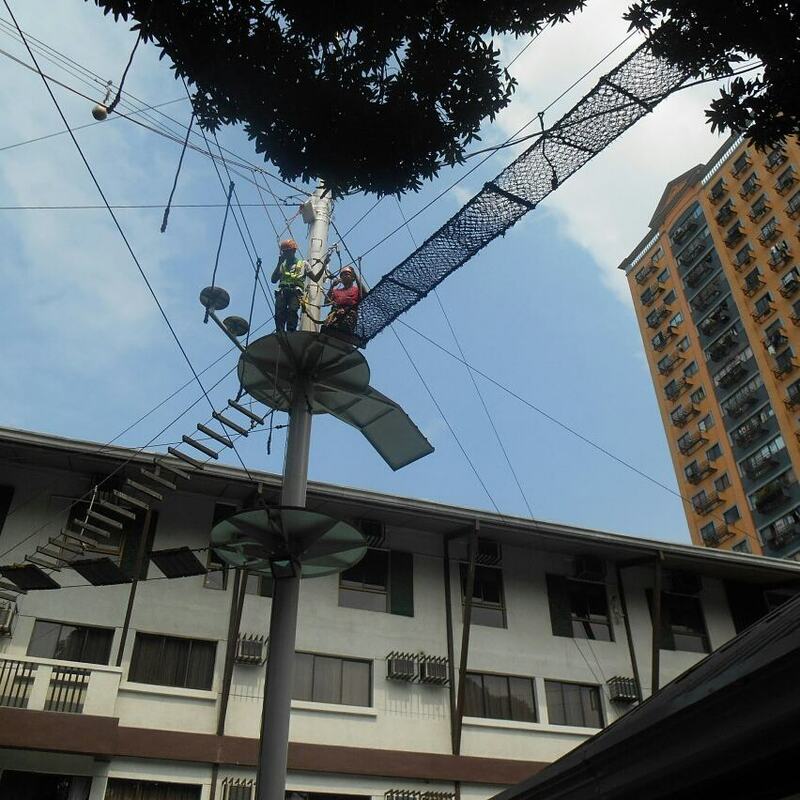 The high rope activities are being facilitated by the trained personnel of the hotel. I was eager to try the zip line and some high rope activities- I have weak knees, I'm not sure if I'll be able to balance myself up there. But yeah, the challenge is to exceed yourself, so #Lavarnnn lang! All ready! With me are blogger friends Anne and JL. Safety first. 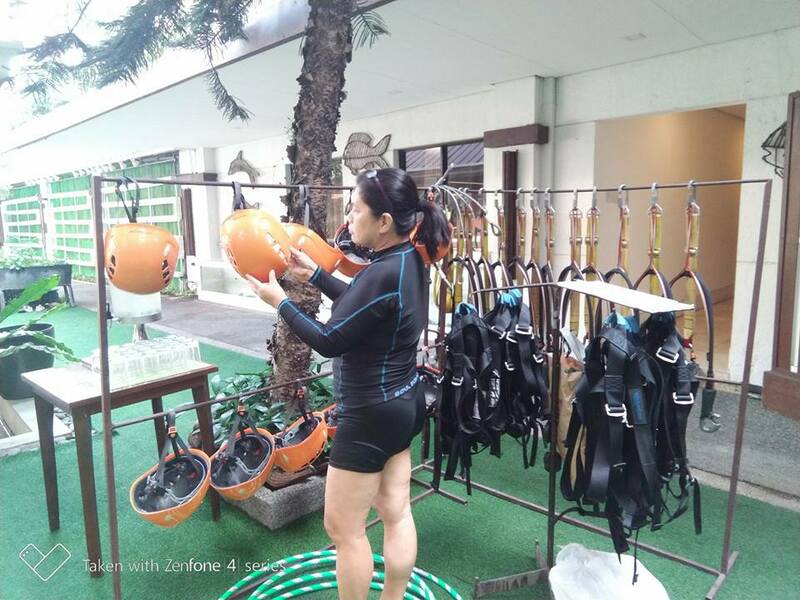 Mommy blogger Lariza Garcia gears up for the high rope activities. 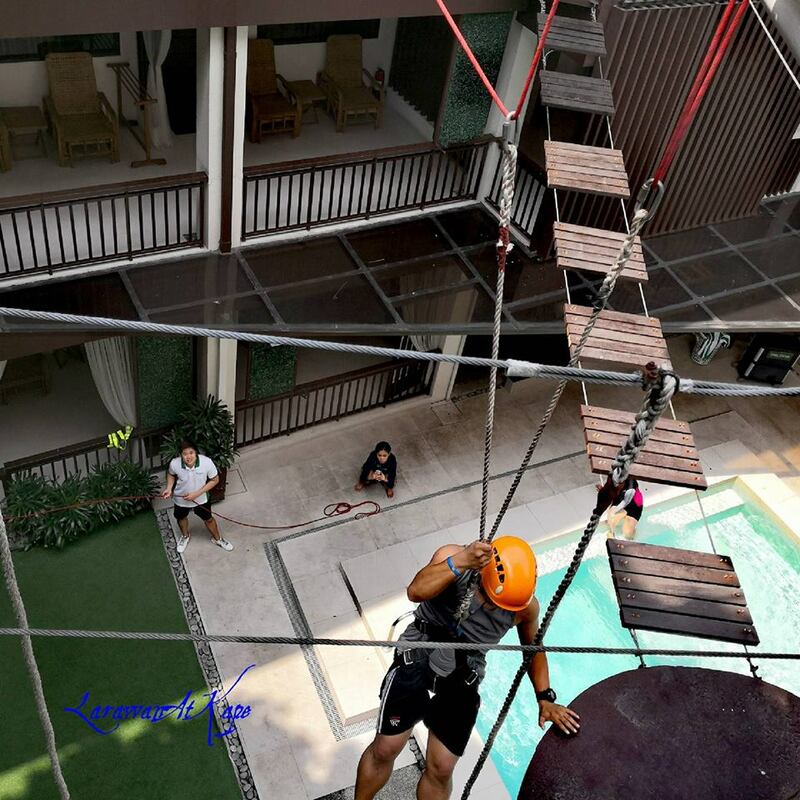 Selah Garden Hotel's HIGH ROPE activities include Wall Climbing, Zip Line, Control Descent, Multi Vines, Jacob's Ladder and Broken Bridge. They also have a 'Free Fall'- something that I initially wanted to try since I have done something like this before (check my TREE DROP video HERE), but for some reason, I chickened out. Boo me. And who will not get intimidated when you have to jump this high? And then my most favorite activity here- the ZIP LINE! You read that correct! 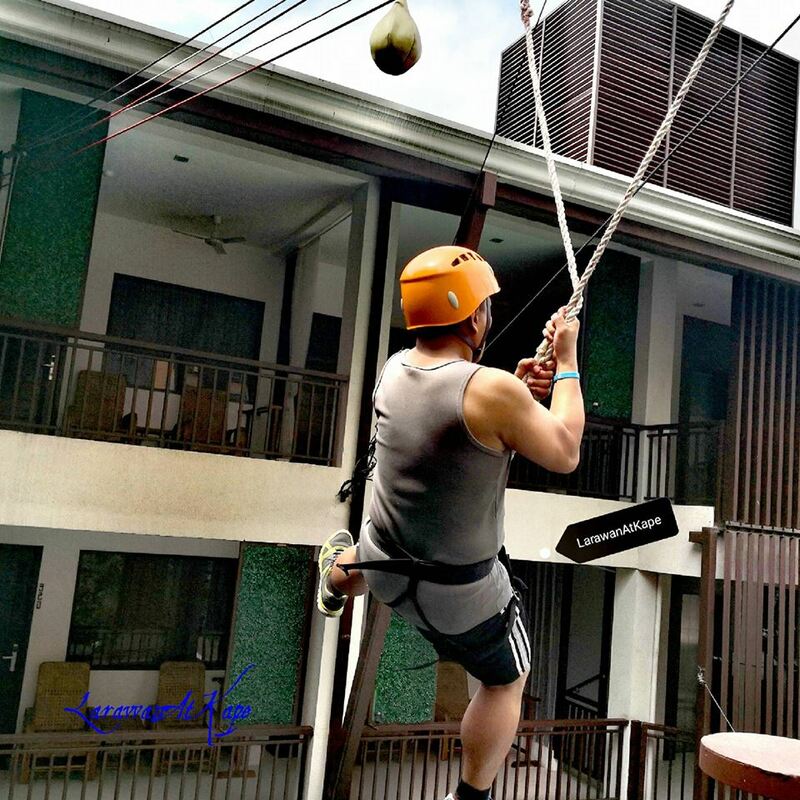 A hotel with a zip line facility- how cool is that? 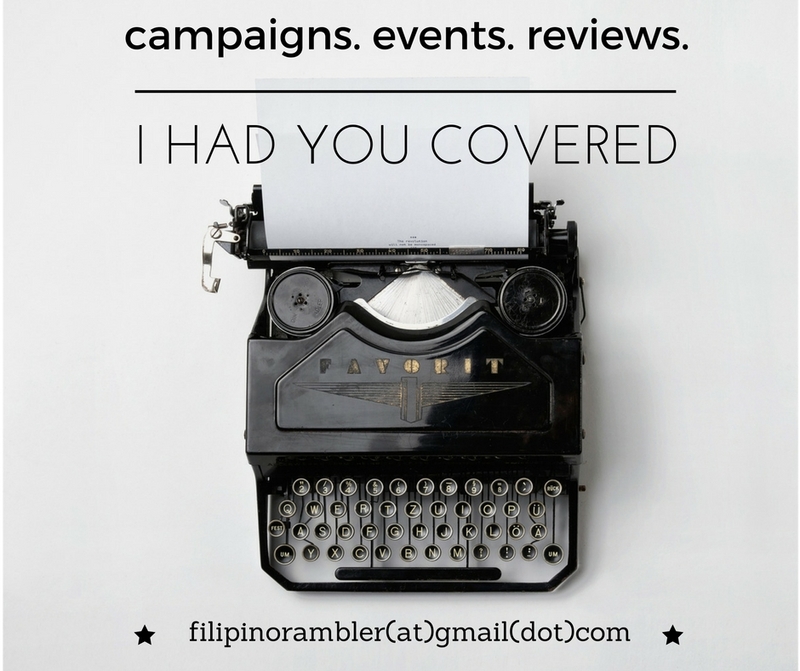 The TEAM BUILDING PACKAGE costs Php 1,500. Package includes AM and PM snacks, Team Building Kit ( face towel and stringed bag or tumbler) and use of function room. A minimum of five persons required. It was fun to have experienced the Team Building activities at Selah Garden Hotel. 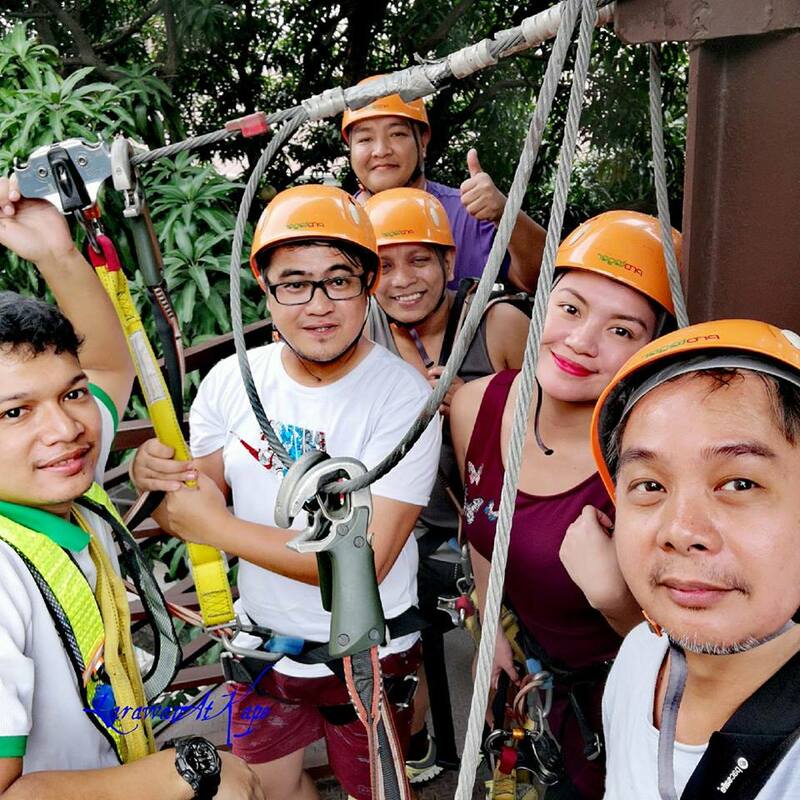 The high rope activities sure sent chills to our spines and made our legs and knees go jelly- but conquering the challenges gave us pride because we did it! Barriers are there and one has to decide whether you just give up or do something about it. After everything's over, we were more rock solid. Activities like these truly bring every members together for a common cause. We were able to identify our strengths and weaknesses. We've come up with a good strategy and improved our ability to solve problem. One can not deny that having a Team Building is a good investment especially for companies.Events like these positively affect the productivity of each members and the company as a whole. 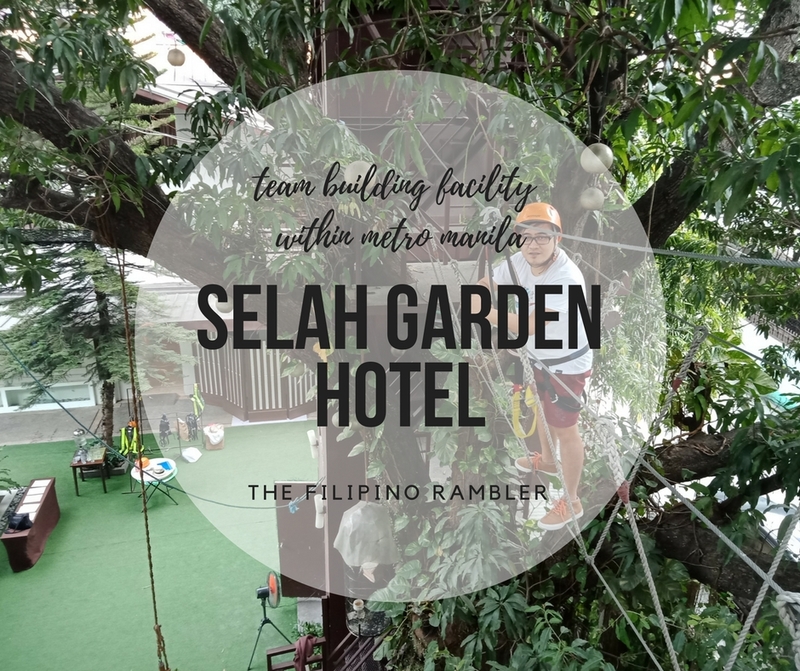 For groups and companies who are looking for a team building facility within the metro- go to Selah Garden Hotel.